The Marco Island Marriott Beach Resort, Golf Club & Spa is undergoing a $250 million expansion to add nearly 100 guest rooms, double its meeting and event space to attract more conferences and exhibits, and pave the way for its conversion to an upscale JW Marriott-branded resort. The expansion necessitated the need for improved stormwater remediation and drainage upgrades. With limited space, the detention system would need to be placed underneath a parking lot. Low cover requirements were also a design consideration. To address these issues, Engineers at Rabau & Associates selected a detention system constructed from 40, Terre Arch 26 units. 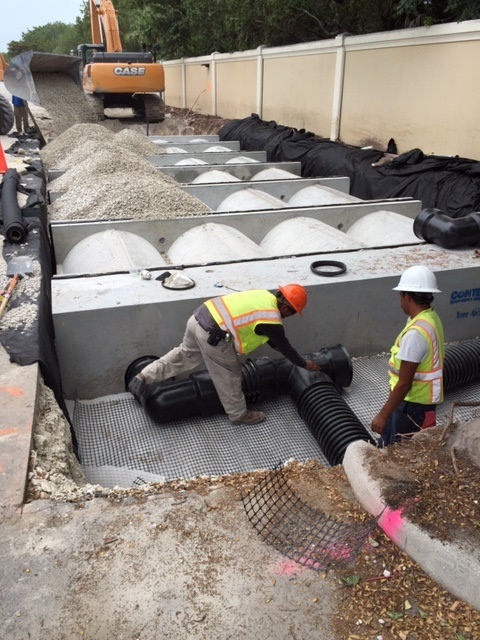 Terre Arch is a modular, multi-chambered, precast concrete stormwater storage system engineered for underground installation. Terre Arch 26 is a connected four arch precast concrete structure providing 277 CF of installed storage and 152 SF infiltration area. Terre Arch provides a load-bearing rating of HS-25 and requires only 12” of cover from the top of the arch to final grading, making it the perfect choice for this project. Terre Arch installs quickly, and the units were lifted in place using a backhoe. The entire project, including installation and backfill, was completed in only three days.